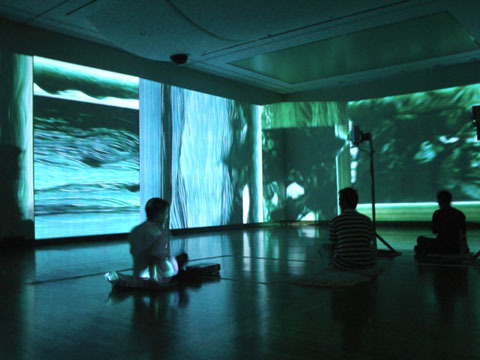 Borealis is one of Steina's most renowned video works; it is a multi-screen video piece that features images form Iceland. The piece was finished in 1993. Steina grew up in Iceland by the Aurora Borealis and was surrounded by volcanoes, geysers, and other powerful natural phenomena. 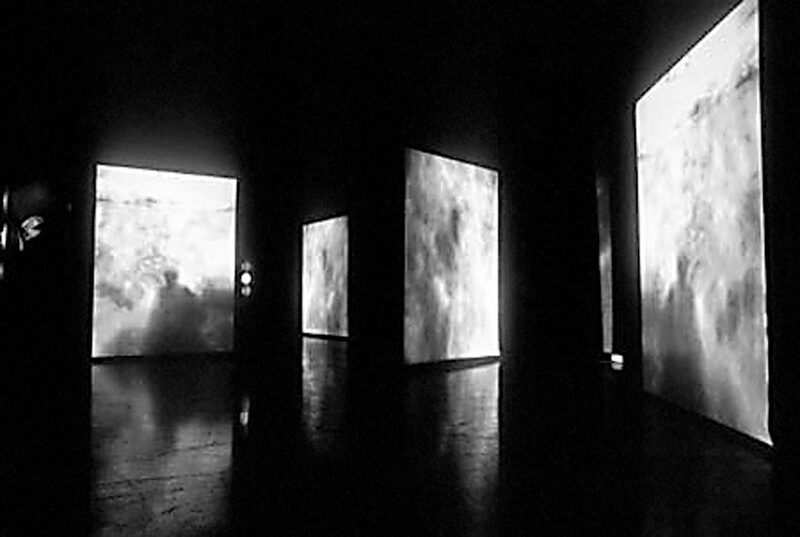 The audiovisual installation Orka expresses motion, a motion that runs counter to the laws of physics and the “frame-bound image”. The overriding formal orchestration of image events and their relatedness resembles the composition of a visual symphony. Steina describes the roots of her visual thinking, expressed in paradoxical events and free-floating imagery: “Since my art schooling was in music, I do not think of images as stills, but always in motion. My video images primarily hinge upon an undefined sense of time with no earth gravity. 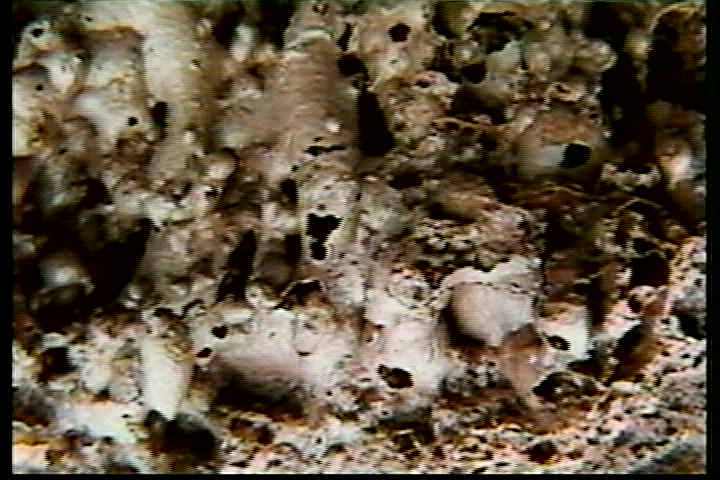 It is like a duty to show what cannot be seen except with the eye of media: water flowing uphill or sideways, upside down rolling seas or a weather-beaten drop of a glacier melt.” This approach to expanding perceptual expectations also has an immersive dimension: when the single-channel videotape Orka is set up in a three-channel video environment, the visual material is shown on translucent screens that are equally intense on both sides. “The idea is that perhaps the audience could feel a part of this creative trance, living for a moment in a mental world where they have never been". Apart from the sheer size of Seven Worlds, Steina's fifteen large video monitors stacked in three rows gave the show its dazzling keynote image. Each screen projects one or another of several variations of a computer-generated sphere, each one a transparent globe or oculus in constant kinetic and acoustic permutation. The images evoked in the glass orbs range from microscopic to macroscopic: micro-organisms, crystalline sphaeraphides from plant cells, steep canyons, ocean surf, vast seas on a distant planet's surface. The spheres float unmoved and unmoving as their surfaces transform, at times turning inside out; or they spin slowly in place about an imaginary axis. The simultaneous projections of these kaleidoscopic globes produce the monumental effect of some distant galaxy, yet the breadth, beauty, and kinetic rhythm of these patterns, modeled on nature and natural process, create a harmony of the spheres whose reference is always the earth - as in fifth largest Planet in the solar system. For all the visual draw of these stunning images, the result is more than mesmerizing. Vasulka succeeds in transforming the electronic moving image into video metaphor. It is almost immaterial whether viewers' thoughts turn to global warming, the Kyoto Accords, or the first time they peered through a telescope. What is material is the act of thinking: the movement from passive response to active reflection. Steina is at least since the 1980s returning to her native Icelandic landscape regularly, and many of her videowork are inspired directly or indirectly by the northern nature of the "island of water and fire". As if this archaic landscape, the landscape without trees and surrounded by the omnipresent water increasingly embeded into her ouvre. The output may be audiovisual installations, sometimes origined in single-channel video. The series of Icelandic reminiscences consists mainly of a 2-channel installation Borealis (1993), 3-channel Orka (1997), Nuna (1999), multi-channel Mynd (2000). .... of the North (2001) is featured on fifteen monitors and Moss and Lava (2001) is two screen. All the works are based on analogue (later digital) video and audio documentary material and are composed from materials recorded by Steina during her regular hikes across Iceland. The first structural Icelandic landscape video painting is Borealis. Its name is probably derived from the residential project Borealis IV in which Steina took part in 1993. 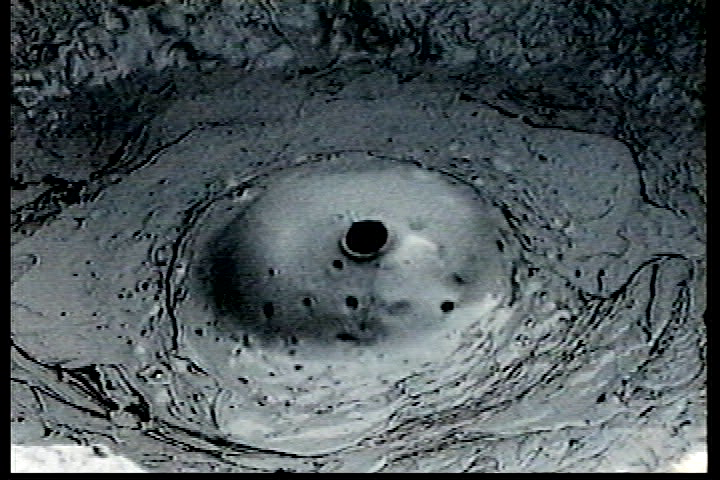 The Nordic Council invited several internationally active artists to a 5-week stay in Iceland, and in the spring of 1993 a series of residences took place. Among the invited guests were beside Steina Vasulka as well Finnbogi Petturson, Swiss Roman Signer, Tatsuo Myiajima from Japan, Giovanno Anselmo from Italy, or Maaria Wirkkala from Finland. Each of these - at least on the internet available documents - received a grant of 10,000 FM (Finnish Marks) as a fee for a new work of art inspired by their stay on the island. 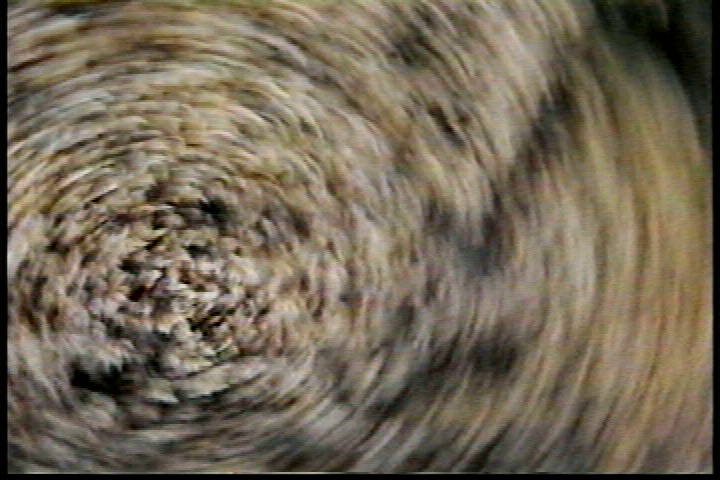 Steina works similar way as with video with sound: the audio is (probably) captured with the microphone attached directly to the camera, then is it adjusted it and synchronized with the video in PC so that the texture of the immersive sound composition is complementary to the restless and volatile image sequences. The musicality of "audio-visual environments" is based on the magmatic stream of flowing luminous and subdued images, hovering around the viewer in dark space projected on semi-transparent canvases. 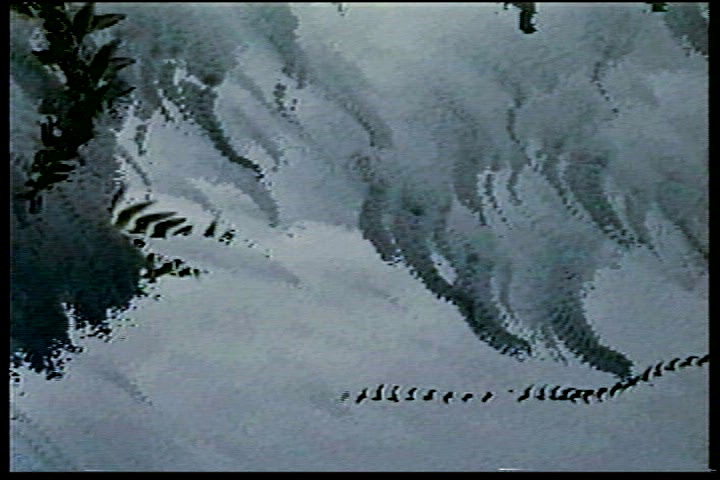 Perhaps the most radical transposition of the Icelandic landscape documentary video is The Idea of the North, or (… of the North) 2001. Here, Steina uses a set of large-format Trinitron monitors to accommodate spaces of different sizes. 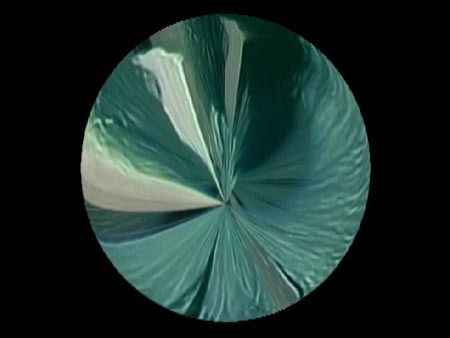 Videos sequences are distorted (edited) into round or circle shapes. A constellation of moving, rotating, turbulent and synchronized planets emerges from the dark space, as if exploring their arteficial surroundings through the lens of the fish eye. The "simple" effect of changing perspective and preview has a surprisingly strong impact of simulating the othernes or "non-human" perception mode. As if an realm of organic microstructures, biosensors, through the eyes of the Icelandic landscape itself is watching the viewer while he came to observe it via the artist's eyes. The motives of the circle and sphere as the archetype of the original cosmical wholeness appear in Vasulka's work from the beginning of her work in the 70's. In the "Idea of the North" installation, (Steina probably refers here to the famous Glen Gould radio play), she expresses her emotive relationship towards the premordial, orphic, mysterious and miraculous landscape of the island where she was born 79 years ago.